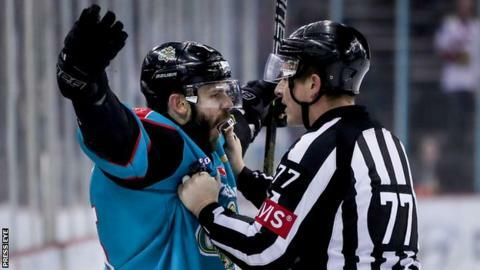 Belfast Giants kept the Elite League title race alive for at least a few more days with a 5-1 win over Sheffield Steelers at the SSE Arena. Pat Dwyer, Jordan Smotherman, Blair Riley, Kyle Baun and Colin Shields got the goals as the Giants kept pressure on Cardiff, who lost 3-1 in Dundee. Sheffield's Ryan Martinelli scored a consolation to prevent the visitors from being shutout. Cardiff's slip up against play-off-chasing Dundee Stars leaves them with a precarious lead having played one game more than Belfast. The Giants got the better of a tightly-contested first period when they took the lead at 12:41 through Dwyer. Baun's speed on the outside was crucial as he beat the Steelers defenceman and then picked out Dwyer with a pass that allowed the former NHL star to redirect past former Giants goalie Jackson Whistle, now between the pipes for the Steelers. The Giants doubled their advantage early in the second period when Whistle couldn't hold onto a rebound from Curtis Leonard's shot and Smotherman showed impressive strength to poke the puck over the line as he fell to the ice. Both teams had to kill 5-on-3 powerplay opportunities with the Giants having to battle for the full two minutes and then shortly after Riley was incensed to be called for interference. Once again, the penalty killers did their job and just as Riley stepped out of the box, Smotherman stole the puck and fed it to his fellow forward, who had no problems beating Whistle at 39:17. The fourth goal came 86 seconds into the third period as Smotherman again showed his power to hold off the attention of the Steelers defence and Dwyer waited for Whistle to commit himself before slipping the puck to Baun for an easy finish. A bullet of a wrist shot from Shields made it 5-0, which allowed Giants coach Adam Keefe to pull goalie Tyler Beskorowany for Andrew Dickson with ten minutes remaining. Martinelli salvaged a score for the Steelers at 11:24 when he beat Dickson shorthanded to put the visitors on the board. The Giants now have three games remaining as they seek a first league title since 2014 - an away match in Coventry on Wednesday and home games against Fife and Dundee next weekend. Cardiff will hope to defend their lead at the top when they host Milton Keynes on Saturday before they finish their campaign at Coventry on Sunday, 31 March.